In an update from our previous article, there is no trade involving Aroldis Chapman to the Los Angeles Dodgers. It is being reported by ESPN’s Jayson Stark that the Cincinnati Reds are telling other teams that there is no deal in place for Chapman and other teams are talking to Cincy about the flamethrower. As we reported, the Dodgers don’t need a closer. They have Kenley Jansen and reports seem to indicate that Chapman is going to test free agency no matter what team he’s on. Unless you are dealing Jansen, why make this trade? 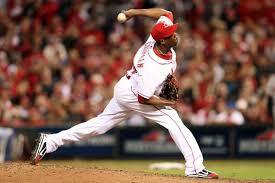 Previous Dodgers acquire Aroldis Chapman, What do they do with Jansen?